"This recipe calls for white boiling onions cooked in Chardonnay and heavy cream. Once you've had these you will never settle for any other creamed onion recipe!" 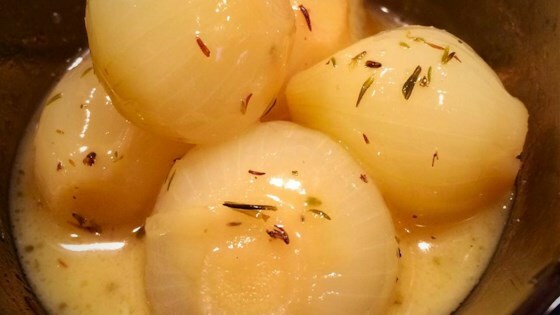 Place onions in a 2 quart pot. Pour enough wine to cover half of the onions. Add the bay leaf, thyme and salt. Simmer and stir for 25 minutes. I followed the recipe to the letter and thought the sauce tasted rancid.